It’s a huge event for archaeologists and anyone interested in the history of America’s first settlers. Findings from three new genetics studies, released last week, are presenting a fascinating, yet complex, picture of the first people in North and South America, and how they spread and diversified across two continents. Our understanding of how the Americas were first settled used to be simple. Today, it’s not. North America’s first migrants, we’ve been told, spilled into the continent at the tail end of the last Ice Age some 15,000 years ago, either by trekking along the West Coast and/or through an interior land route. Eventually, this population found itself south of a massive ice sheet covering North America from coast to coast. From here, scientists assumed that, as populations moved southward, some groups split off, never to meet again. Gradually, this pattern of southward migration and dispersal resulted in the peopling of the Americas. But as the new research suggests, it’s considerably more complicated than that. Humans, as we’re all too aware, aren’t so predictable. A pair of closely related genetics papers, one published in Science and one in Cell, chronicles the movement of the first humans as they spread across the Americas, venturing both southward and northward and sometimes mixing in with the local populations. The third paper, published in Science Advances, shows what happened to one group of migrants who decided to make the high-altitude Andes their home—a decision that sent them down a unique evolutionary path. The Science paper, led by David Meltzer from the Department of Anthropology at Southern Methodist University in Dallas and archaeologist Eske Willerslev, who holds positions at the University of Cambridge and the University of Copenhagen, tracks the spread of humans from the top of Alaska to the tip of South America, a region known as Patagonia. Their analysis presents a complex picture of expansion and diversification across the two continents. By sequencing and analysing 15 ancient genomes found throughout the Americas—six of which were older than 10,000 years—these researchers determined that, around 8,000 years ago, the ancestors of Native Americans were still on the move, migrating away from Mesoamerica (what is today Mexico and Central America) toward both North and South America. These groups moved rapidly and unevenly, sometimes interbreeding with local populations, complicating the genetic—and historical—picture even further. 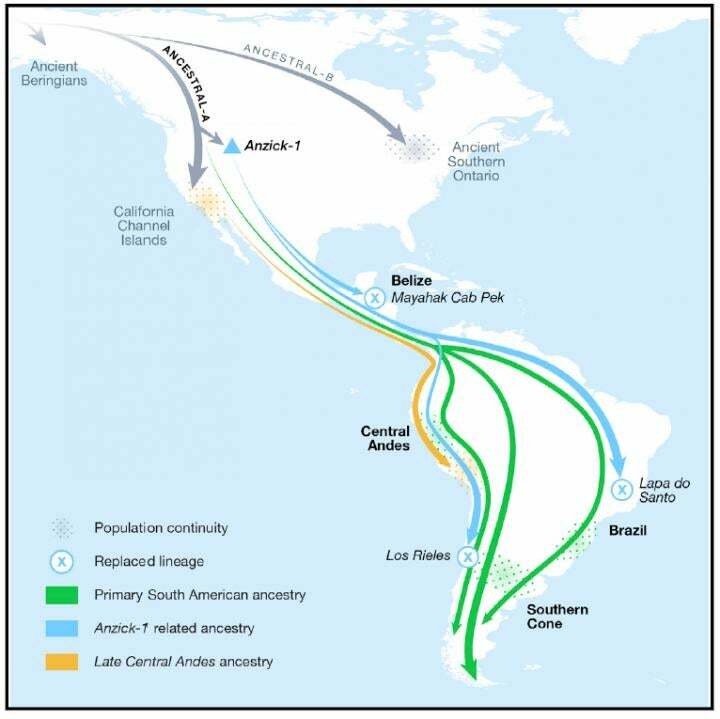 The close genetic similarity observed between some of the groups studied suggests rapid migratory speed through North and South America. The Meltzer and Willerslev team, which included dozens of researchers from institutions around the globe, also identified a previously unknown population with a distinctly Australasian genetic marker—a very surprising discovery. Found at the Lagoa Santa archaeological site, this individual lived around 10,400 years ago in what is now Brazil. The researchers were not able to detect the Australasian genetic marker in any of the other samples studied, including those found in North America. It’s highly unlikely that this population sailed from Australia or Indonesia to South America. Rather, this group likely trekked northward from their point of origin, venturing through China and Siberia. This population likely didn’t spend too much time in North America, eventually finding their way into South America, while leaving no genetic trace of their journey—aside from this lone specimen in Lagoa Santa. Meltzer and Willerslev don’t know if this population arrived before or after the ancestors of Native Americans. This discovery now presents a very intriguing mystery, because this group could conceivably be the first humans to reach South America. Another intriguing result came from an analysis of the Spirit Cave Mummy—a 10,600-year-old skeleton involved in a legal dispute and a scientific controversy. This natural mummy was discovered in 1940 in the Great Basin Desert in the US state of Nevada, and scientists have struggled to understand its origin. The Fallon Paiute-Shoshone Tribe, a group of Native Americans living in Nevada near Spirit Cave, said the remains belong to their ancestors; accordingly, they asked for possession of the specimen under the Native American Graves Protection and Repatriation Act. This request was denied as the origin of the Spirit Cave Mummy was disputed, leading to a 20-year legal battle. The situation changed two years ago when the tribe allowed Willerslev to conduct a DNA analysis on the specimen. His analysis showed that the skeleton is indeed related to the Fallon Paiute-Shoshone Tribe, quashing a longstanding theory that a group of Paleoamericans existed in North America prior to Native Americans. Called the Paleoamerican Hypothesis, this theory first appeared in the 19th century. Danish explorer Peter W. Lund theorised in the 19th century that the remains he studied were not Native American, but the members of some other population, dubbed the Paleoamericans. He reached this conclusion by analysing the shape of the ancient skulls. The Tribe has had a lot of experience with members of the scientific community, mostly negative. However, there are a handful of scientists that seemed to understand the Tribe’s perspective and Eske Willerslev was one of them. He took the time to acquaint himself with the Tribe, kept us well-informed of the process, and was available to answer our questions. 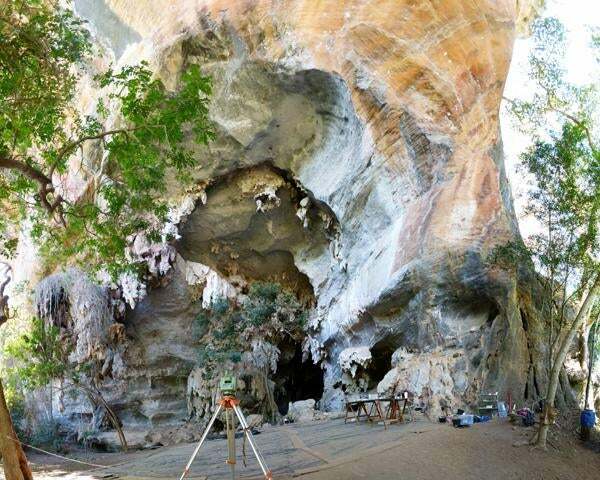 His new study confirms what we have always known from our oral tradition and other evidence—that the man taken from his final resting place in Spirit Cave is our Native American ancestor. The Cell study, led by David Reich, a geneticist at Harvard Medical School and the Howard Hughes Medical Institute, and Cosimo Posth, an archaeogeneticist at the Max Planck Institute for the Science of Human History, used high-quality DNA to identify two previously unknown migrations from North to South America. The first of these two previously unknown migrations shows that the Clovis people, who lived in North America around 11,000 years ago, had a bigger impact on areas to the south than previously appreciated. This migration links the oldest individuals from Chile, Brazil, and Belize, dated to between 11,000 to 9,000 years ago, to the Clovis culture. “This suggests that, surprisingly, the genetic ancestry of people who produced the Clovis culture expanded further south,” said Posth. However, this ancestry was fully replaced around 9,000 years ago by another ancestral group, which left a long-lasting population that exists to this day in multiple South American regions. As to how or why this Clovis-related group got replaced so thoroughly is a complete mystery. 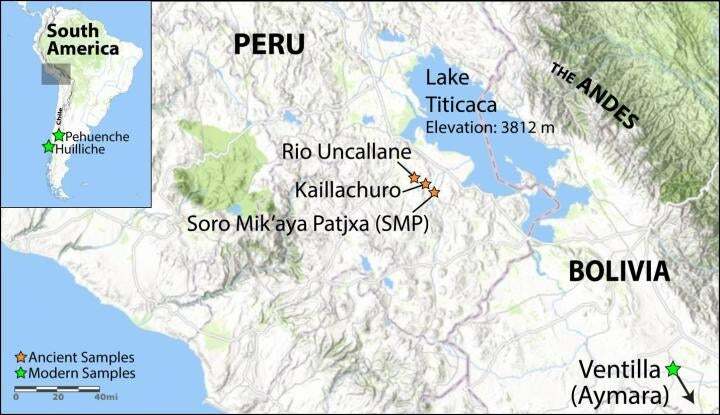 The second previously unknown population migration is associated with the arrival in Southern Peru and Northern Chile of a genetic lineage linked to ancient individuals from the California Channel Islands. This population expansion happened at least 4,200 years ago, but it may have taken place much earlier than that. Ideally, the researchers would like to find DNA older than 11,000 years, and also acquire DNA from regions in northern South America and the Caribbean, which is absent in this study. The researchers aren’t sure how individuals in these regions are related to the ones analysed in the new study. The Science Advances study, led by anthropologist John Lindo from Emory University, analysed the genetic prehistory of people living in the Andean Highlands, from about 7,000 years ago through to European contact. Lindo’s team studied seven human remains found in the Lake Titicaca region of the Andean Highlands of Peru dating back to between 6,800 to 1,400 years ago. These genomes were then compared to the genomes of individuals who lived in both the lowland and highland areas during prehistoric and modern times, allowing the team to identify any physical adaptations that happened prior to the arrival of the Europeans some 500 years ago. Archaeological evidence suggests this group began to occupy the Andean Highlands around 12,000 years ago. The new genetic evidence shows what happened as a result. Similar to the ancient inhabitants of the Tibetan Plateau, this group quickly adapted to the high altitude extremes, gaining resistance to cold temperatures, low oxygen, and UV radiation. Fascinatingly, the Andean highlanders also acquired the ability to digest potatoes, a domesticated crop derived from wild tubers. The researchers also documented a smaller-than-expected population decline following the arrival of Europeans and their attendant diseases. Elsewhere, in both North and South America, indigenous populations experienced population declines up to 90 per cent. The death rate among the Andean highlanders, however, was closer to 30 percent. To explain this, the researchers point to a fortuitous mutation among the highlanders—an immune gene correlated with smallpox, which may have conferred a protective effect. Another very likely factor, however, was the remote location of this population. The harsh mountain environment may have buffered this group from the Europeans and their attendant diseases, the researchers say.